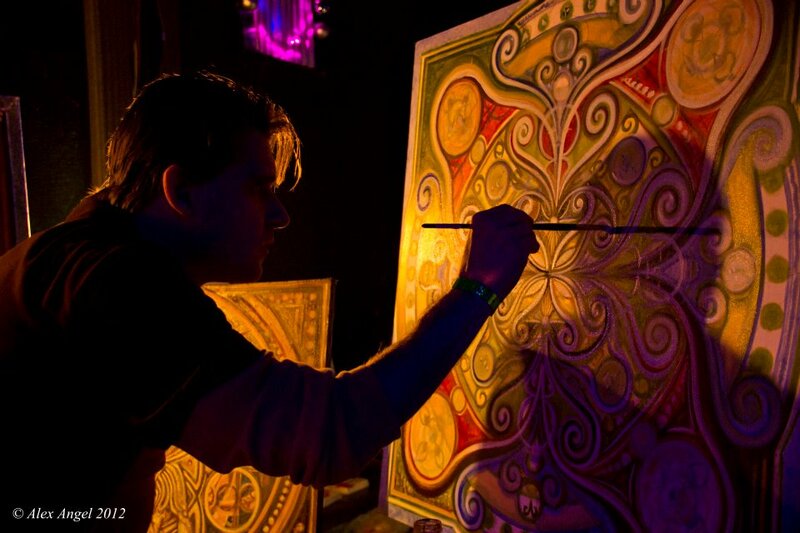 When I first began painting Mandalas, some 10 years ago, I had a vision of myself painting LIVE during musical events and for a long time it was simply just a dream. However, it was a dream that kept growing larger and larger, banging at the insides of my skull wanting to be released into reality. 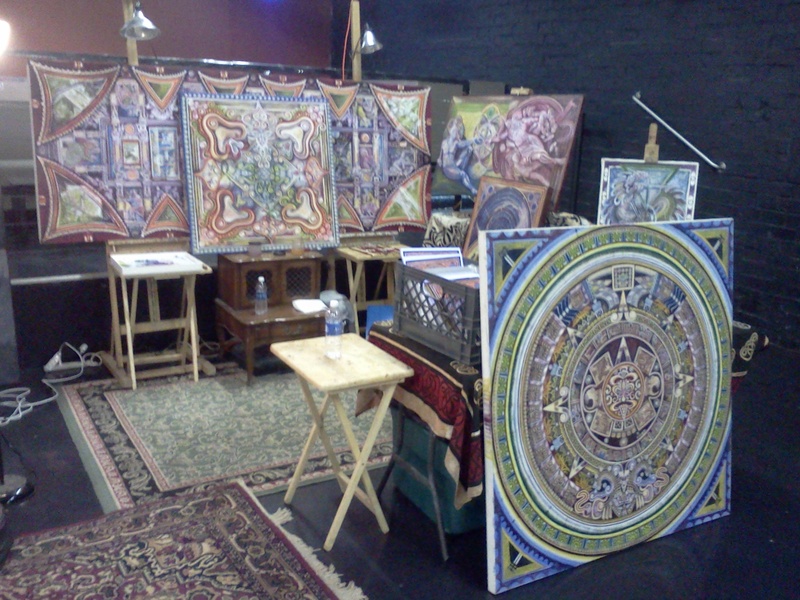 What was hindering my manifestation was the wall 99.99999999% of ALL artists face . . . FEAR! Then I had the fortunate invitation to move into CoLAB and found myself within a wonderful community to paint LIVE during our events. Surrounded by my friends and the people I love, I felt comfortable to begin exploring this vision, and from there, the dream grew wings. 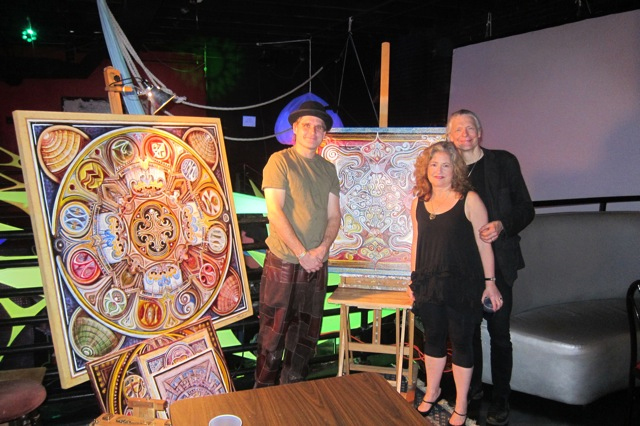 During music events, my desire was to capture the essence and energy created between the music and the audience and transfer it onto the canvas within the Mandalas. Most of the time, having no idea what I would paint or which direction I would go with the piece, I felt the emotions and translated them into patterns of color and geometry. The ultimate goal is to not finish a painting in a single setting, but to develop a sense of story and connection between events. Each piece evolving through time with each new event, carrying the story like a visual bard from location to location. As people experience my artwork, they become a part of its evolution with each event. They see it grow and transform as they themselves grow and transform through time. The images acting as a mnemonic device triggering their memories generating a feedback loop between where they’ve been and where they are going, all a flash within their present moment of being . . . enhancing awareness of self. Each event is different, bringing pieces that will reflect the theme of the night magnifying the story and experience. Sometimes I bring a few pieces and sometimes a full on gallery . . . it all depends on where my personal evolution is, which stories I want to tell and which direction I wish to inspire towards and beyond. My work is meant to heal and inspire, spiralling upwards towards balance . . . The most beautiful thing is seeing, across the experiences, everyone’s individual transformation and personal growth and watching, firsthand, themselves evolving into the being they are trying to become. To teach without teaching, to learn by just being . . . I hope to continue evolving this concept, this story that is refection of my community, weaving it within all my artwork. I hope it becomes a vessel to explore this world that surrounds me, and take me cross the horizons of my imagination, and in the end, that is all my work is meant to do . 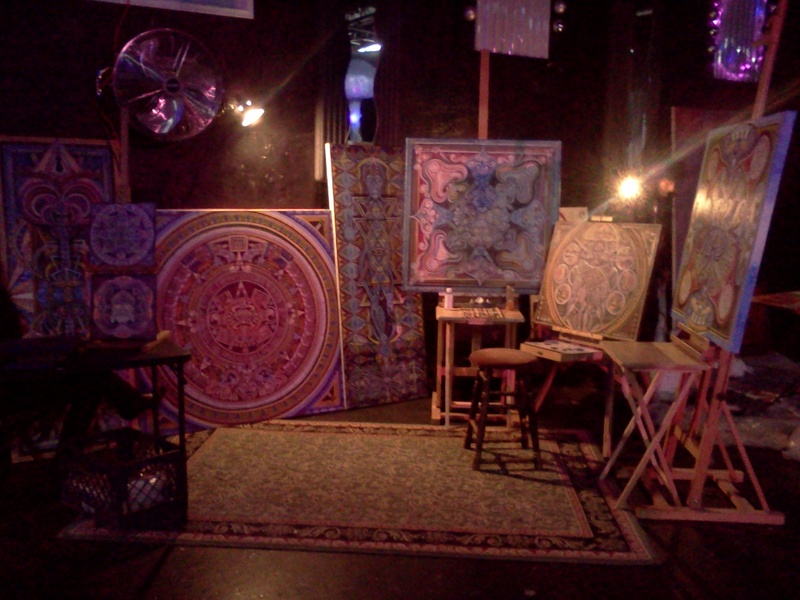 . . to inspire creators . . . .
LIVE Painting at pARTy 5 . . .